I had my heart in my mouth last Sunday night watching the CNN program “Anthony Bourdain’s Parts Unknown”. He was in Colombia! That’s a place where I would dearly like to go although I have to admit it has gotten such bad press that it scares me somewhat. I was hoping to be told what a safe and wonderful place it is and the host did a good job of projecting that. In fact he said that it was the “most welcoming” of all South American countries he had visited. The part that had me on the edge of my seat was when he went to the Guajira Peninsula, home of the Wayuu people. 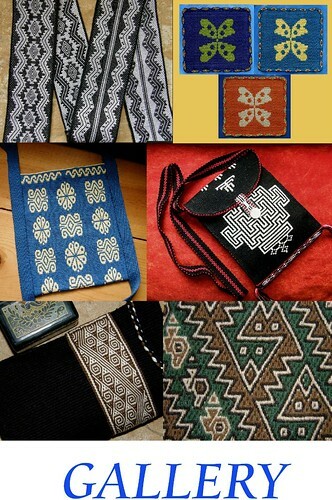 If you follow my blog you will know that through Mirja Wark’s book, I have been using Wayuu si’ira belt patterns to inspire some of my weaving. Mr Bourdain wandered through the markets and I recognized versions of the typical embroidered dress that the Wayuu women wear. Mirja had modeled one for me when I visted her in the Netherlands last year. It was nice to be able to catch these glimpses of life in the market and learn a little about local food. But, sadly, he didn’t go looking for weavers or for the craftswomen who make the beautiful crocheted susu, or “mochilas”. He and his guide swung in hammocks after a day of ripping along the coastline on noisy four-wheel bikes. Yes, we got to see all that as well as the host falling off his bike on his head but didn’t get to hear anything about the woven hammocks. Too bad. 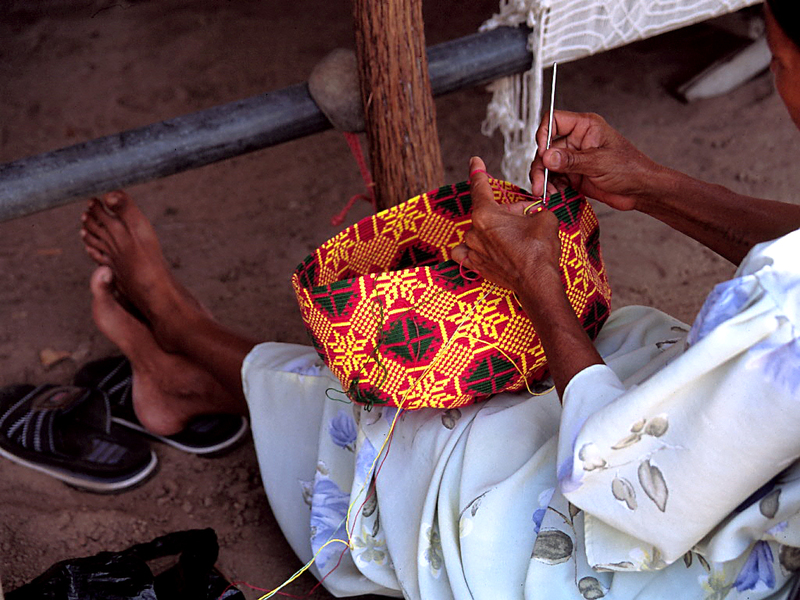 Fortunately, I found a gentlemen online, Jose Jaime Araujo, who has visited the Venezuelan side of the Guajira Peninsula and who is willing to allow me to share pictures that he took of the textiles and craftspeople there. He visited a market that looked very similar to the one that Mr Bourdain showed on the CNN program. 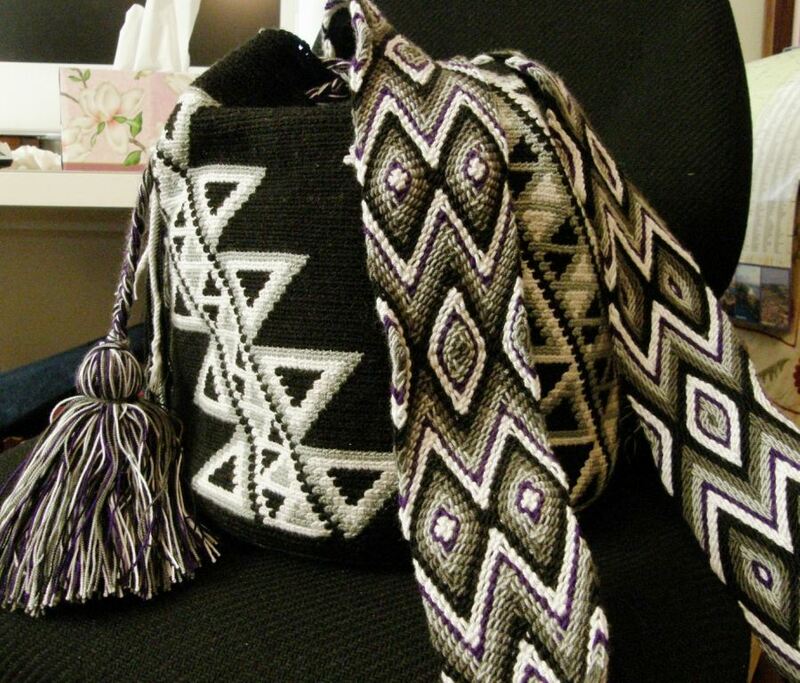 Here you can see Mr Araujo’s guide using one of the susu, the typical crocheted bag, used by both men and women. 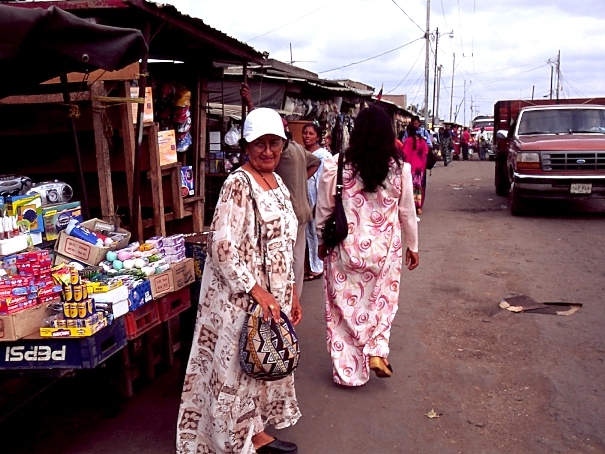 This could easily be a street market in Bolivia except for the beautiful flowing dresses that the women are wearing . I expect the music they are playing (all markets here in Bolivia jump to the rhythm of various pieces of music clashing merrily together!) is different and you would be hearing the sounds of the Wayuu language. Mr Araujo’s guide acted as his interpreter. Imagine….a stick with a hook on the end and talented hands are the only “tools” needed to create such a beautiful piece! 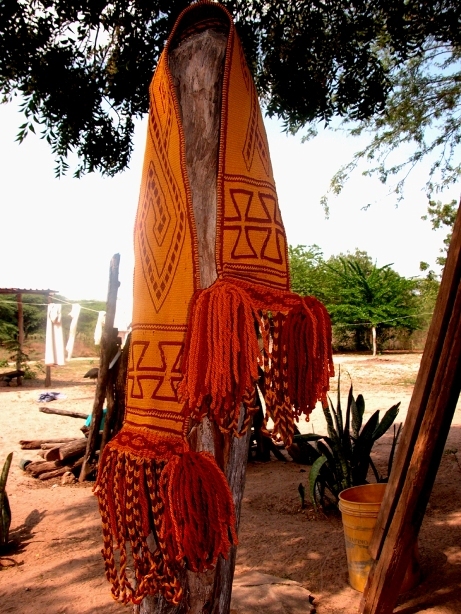 I got to see one of these susu, or “mochilas” when I visited Dorothy on my recent US trip. Mirja, in Holland aslo had a fine collection. I will leave it up to the crochet experts to look at this and understand how it is done! 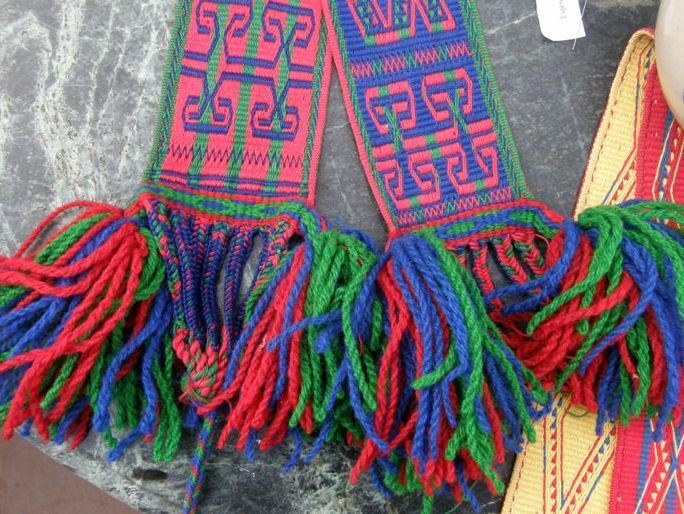 Mirja told me that the art of weaving the si’ira belts is on the verge of dying out and that she found it almost impossible to find someone who could show here how to do it. 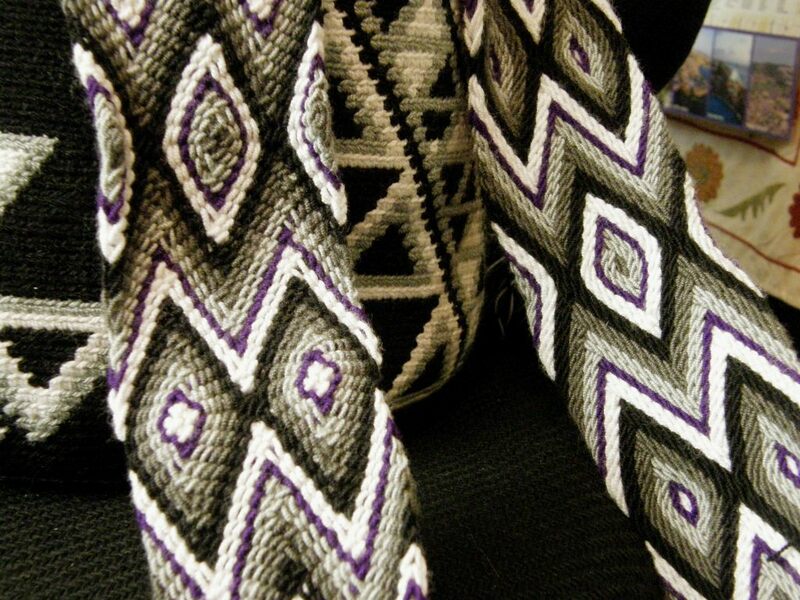 The belts are woven on simple vertical looms. Mr Araujo was lucky to find this elderly lady working on the ends of a belt after it it had come off the loom. This is eighty-five-year old Maria Úrsula Ipuana and Mr Araujo describes her as a living legend. 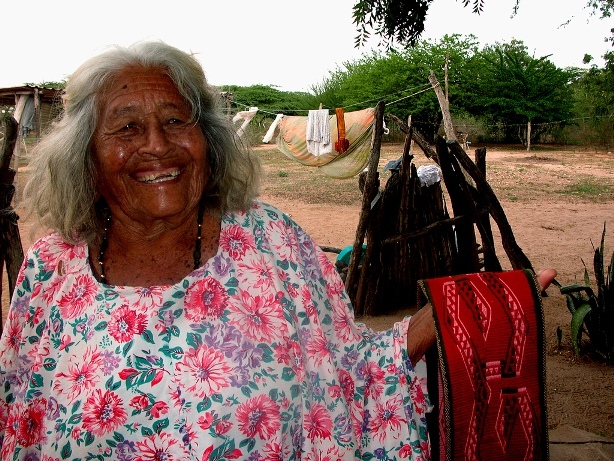 She is one of the best Wayuu artisans that knows all the techniques of weaving. Right now she is passing her knowledge to other young Wayuu women. You can just make out the “like the nose of a cow” pattern at the end of the belt, a version of which I used in my wall hanging. In this next picture Maria Úrsula Ipuana is holding two single loops in her hands and is most likely adding some countered twining to unwoven warp ends. 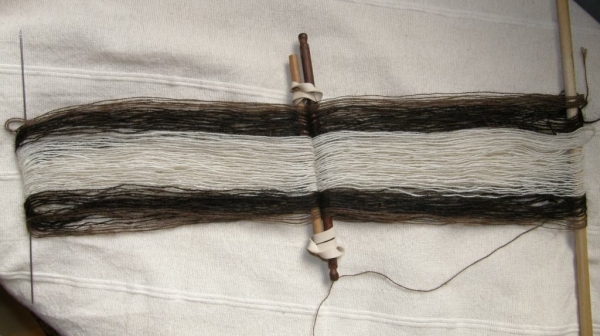 You can see how the threads in the first row of white twining are diverted to swap places with the threads in the second row of black twining and then vice versa as the twining proceeds across the warp ends. 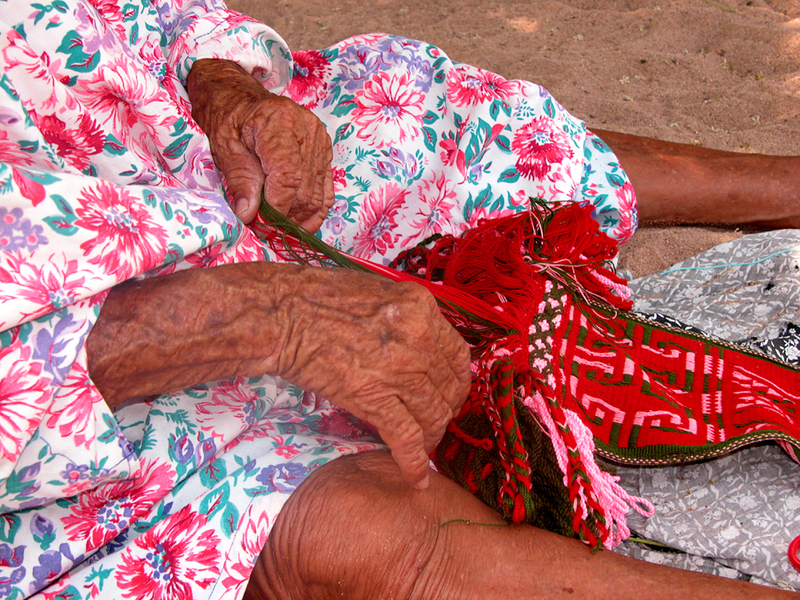 Included in Jose Jaime Araujo’s collection of photos are ones of Wayuu women twining across large groups of warp ends which Mr Araujo says will be a hammock. How spectacular is that?! This is something I wouldn’t mind trying. Here is another one with white on white…gasp! Photo by Jose Jaime Araujo. Above, Maria Úrsula Ipuana shows a man’s ceremonial belt, a si’ira that she wove. 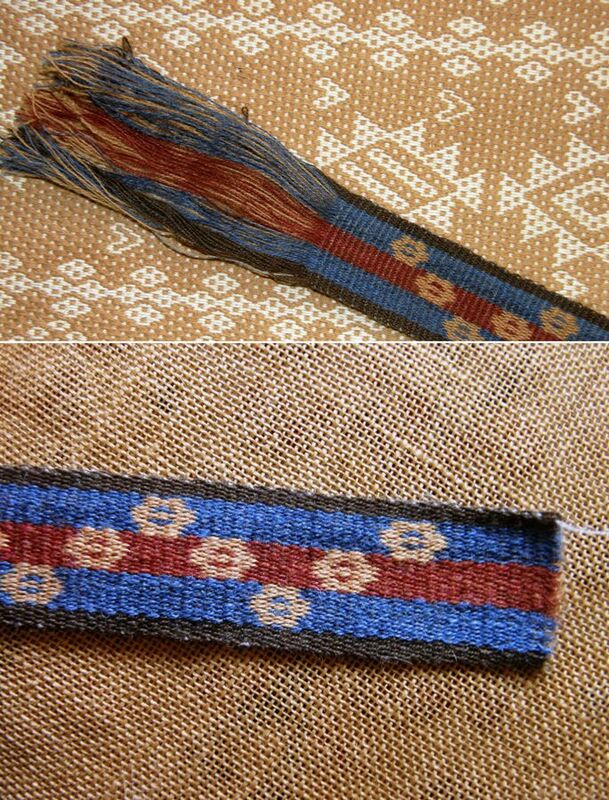 You can see another stunning example at left and get another look at the weft twining at the end of the belt. Jose Jaime Araujo’s flickr page has more pictures of the Wayuu people, their environment and crafts which include hat-making. Thanks to Jose Jaime Araujo, we get to see a little of what Mr Bourdain neglected to show us. In the meantime I will look with a little more confidence at Colombia and maybe Venezuela on that long list of places I would like to visit. Back here in Bolivia, I am still breaking down that seven weeks of accumulated dust and evacuating some unwelcome spiders. Fortunately, I saw this poem on Facebook, by an anonymous poet, only after my work was mostly done. Otherwise, I may never have done anything at all! But, I found that dust I must as I had a visitor last weekend from Australia. Wendy Garrity stopped off in Santa Cruz on her way to the highlands. 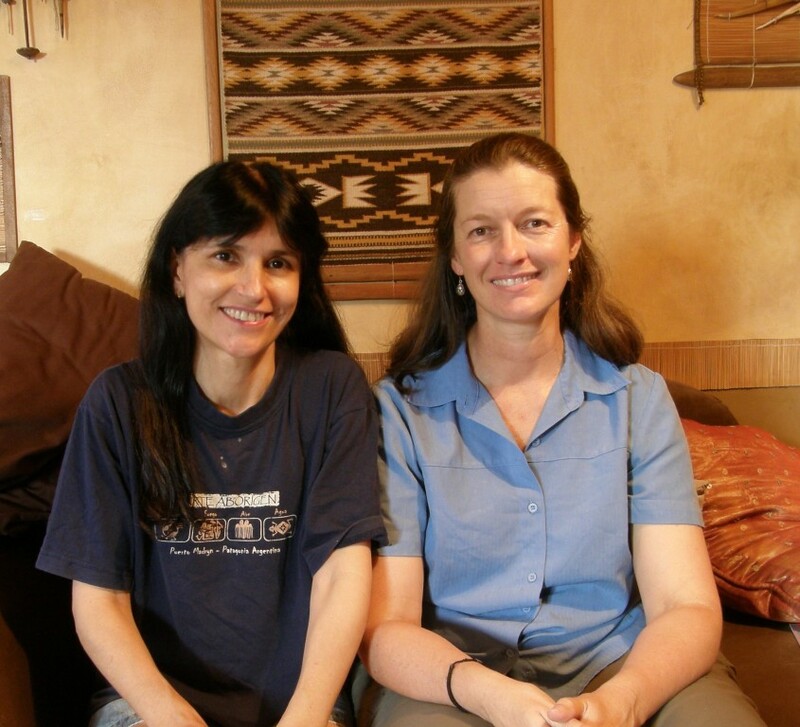 Wendy spent some time in Bhutan teaching music and learned to weave at a weaving center there. When I found that last piece of crucial information on her blog, I told Wendy that I had wanted to jump through the computer and hug her. That saved me a lot of trial-and-error. Well, who knew that she would turn up in my home and get that hug for real?! We spent two days chatting in “Australian”. I always like feeding backpackers who have either been living off cheap greasy cafe and bus terminal food or noodles that they cook up on camping stoves by the side of the road. It makes my simple cooking seem like something wonderful! We poured over the Bhutanese patterns in David Barker’s books and Wendy told me the names and meanings of many of them. We talked about our travels through Asia…mine having taken place mostly in the mid eighties to early nineties and involved mostly trekking up and down mountains. Wendy’s travels in Asia have been about working and looking at textiles. We shared what being away from Australia for extended periods of time is like. I have been living outside Australia for 20 years now! I taught her a simple Andean pattern on a narrow band so that she could take it along with her on her travels. 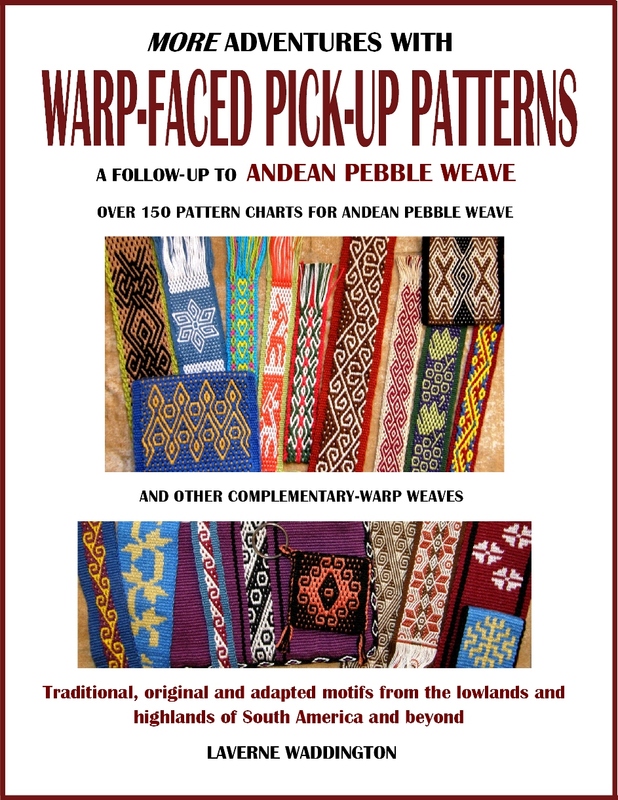 It is a complementary-warp pick-up technique which will give her a little insight into some of the textiles that she will see on her way through Bolivia and Peru. While Wendy wove her tanka ch’oro pattern, I set up to weave with my friend Janet’s gorgeous handspun wool. This yarn came from a basketful which Janet invited me to dive into and sample. So, I made up a short warp for the intermesh technique. 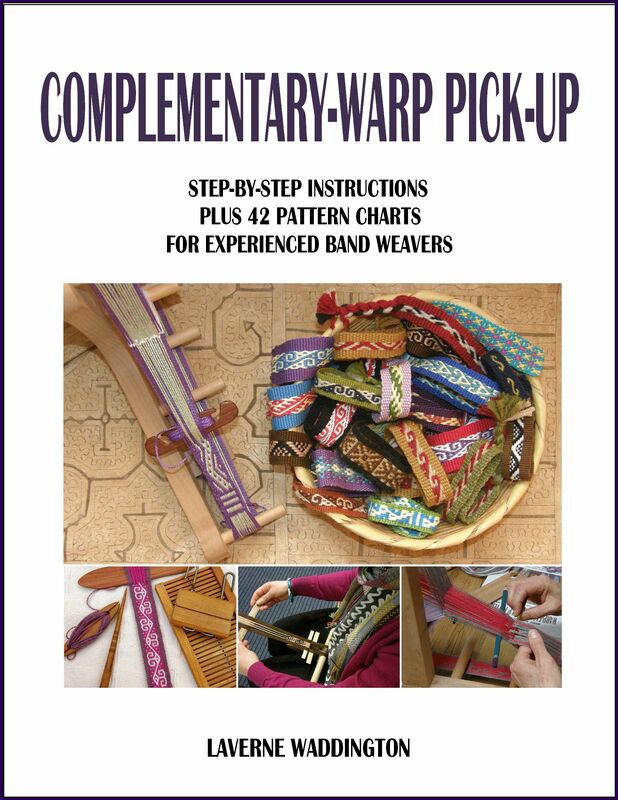 I weave it as a two-heddle method and teach it in my second book. 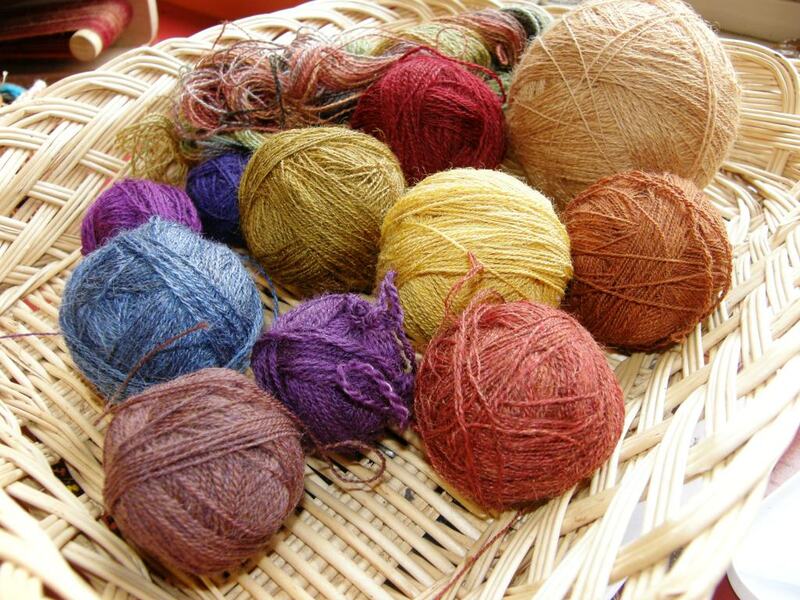 I have to tell you that Janet’s yarn is just wonderful to weave with. I have spun llama fiber that I bought here in Bolivia (very dry and coarse stuff it was!) and some beautiful alpaca fiber that Janet gave me. I carded the fiber to prepare it for spinning on my drop spindle. I spun the llama fiber very tightly but tried not to overspin the alpaca. While I was happy with the results, I knew that on a very long warp my handspun would probably start to break quite frequently. Above you can see my handspun llama in pebble weave and double weave projects. My handspun alpaca lay happily flat when not under tension but this is just a teeny tiny warp…just enough for a cell phone pouch… so, who knows if the yarn would have stood up to a longer project. Janet combs her wool rather than cards it and the yarn she offered me had been spun on a wheel. I don’t believe that her yarn is anywhere near as prone to breakage as my llama yarn was. Janet’s yarn is wonderfully smooth and resilient without being overtwisted and kinking back on itself. 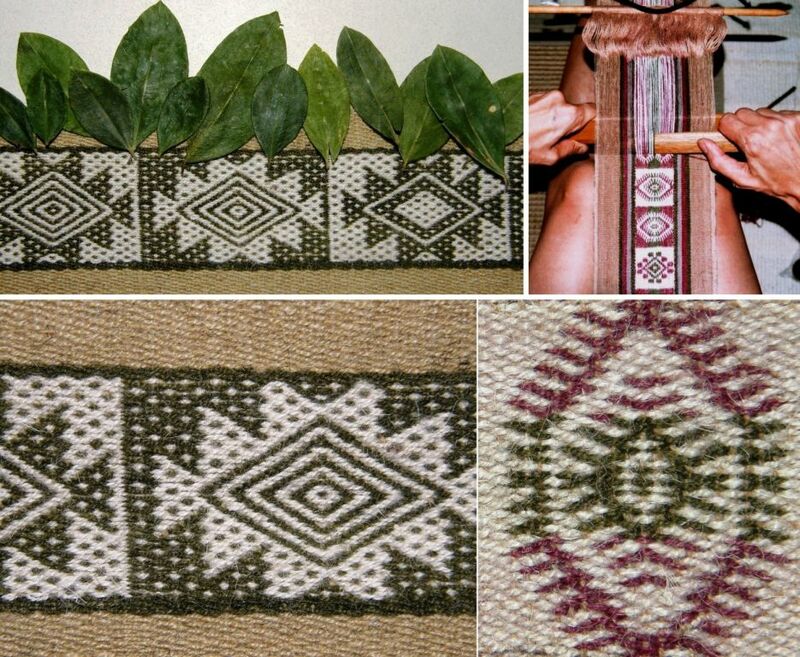 It is perfect for warp-faced weaving and produces fabric that almost lies perfectly flat. It tilts ever so slightly at opposite corners but I have to tell you that sometimes the bands that I weave with Tahki Cotton Classic twist more than this band I made with Janet’s wool! I used a very simple intermesh pattern just to test the wool. The weft is a light gray fine commercial wool. You can see my teacher Maxima’s bands corkscrewing nearby. 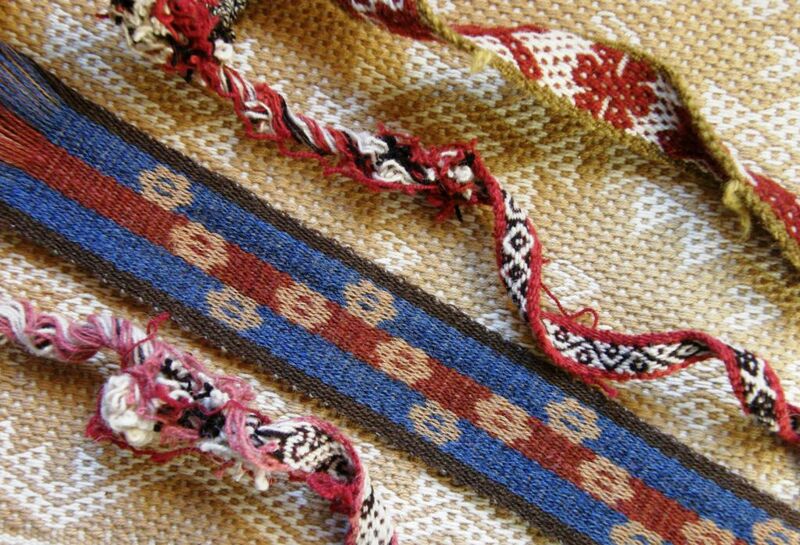 Those band were woven using Maxima’s handspun as both warp and weft. You can see a little twist in the unwoven brown warps below but there is certainly none of the furious kinking back that one often sees in yarn spun for warp-faced weaving. I love the neat third selvedge that working with wool produces. 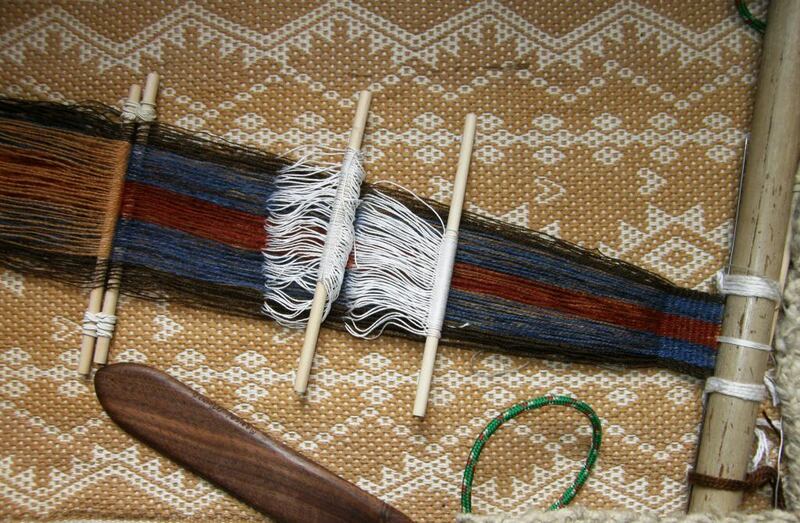 And that is all I have done with my backstrap loom since getting home :-(….that darned dusting!) But, I have been busy with my inkle loom. Why? Because I am writing an article. My wee inklette is one of the dust-covered items that needed taking down from the shelf. Now it is warped up and is being posed all around the place for photographs. I have to admit that sometimes I wish I had a bigger heavier inkle loom. If the article ends up on a printed page, I will tell you all about it! There was sudden flurry of activity in the Ravelry group right at the end of a pretty quiet month and I have a bunch of things to show but will save most of it for next week. 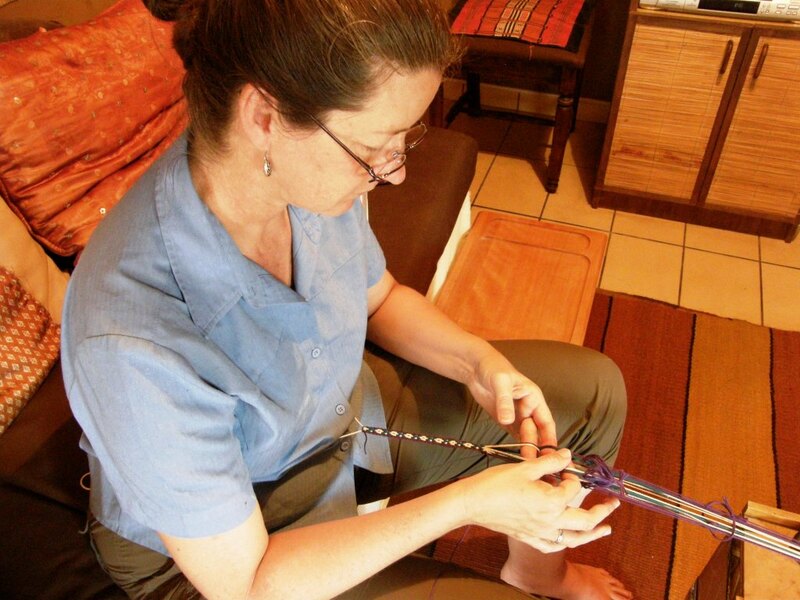 Bobbie posted a tiny image of the ergonomic bench for backstrap weaving that she built following the instructions that Synergoarts has put online. It looks like she has done a perfect job and we hope to see a large picture of her using it soon. Bethan, in Scotland, sent me a pretty spring picture of the warping board she built following pictures of Guatemalan warping boards that I have posted here. 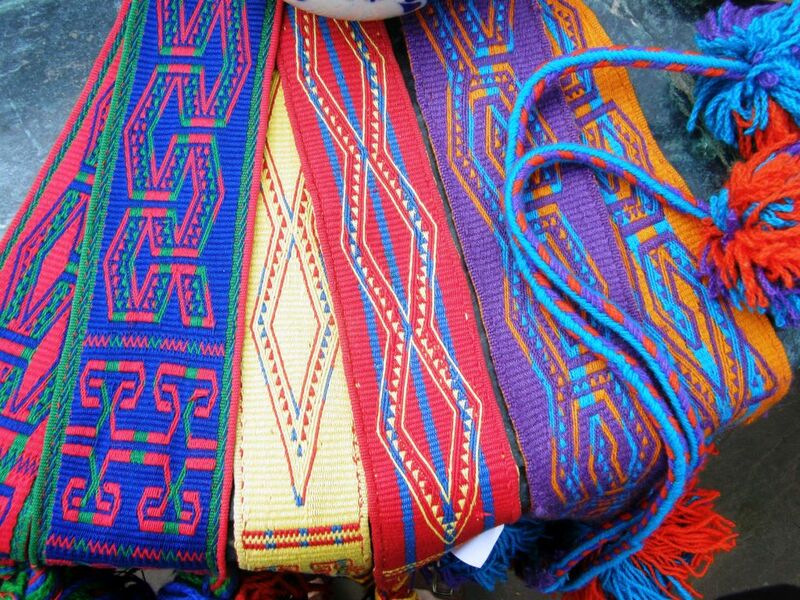 The warping boards that I saw in Guatemala all looked like this in various sizes. To keep the set-up compact for long warps, the warp is extended to one end and then turns a corner and comes back to the starting point. There I was thinking that this system is unique to Guatemalan weavers when I remembered that Sasha, who wove with me in Portland last year, learned to weave with cotton in the Piura region of Peru. 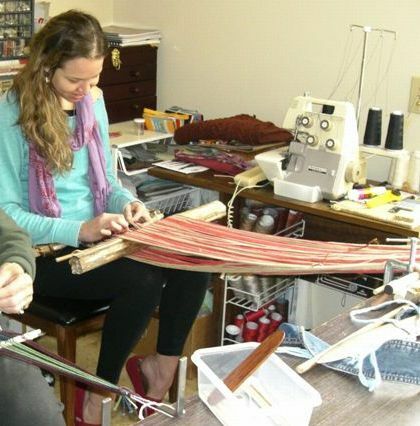 She shared pictures with me of the warping set-up her teacher used in her home. 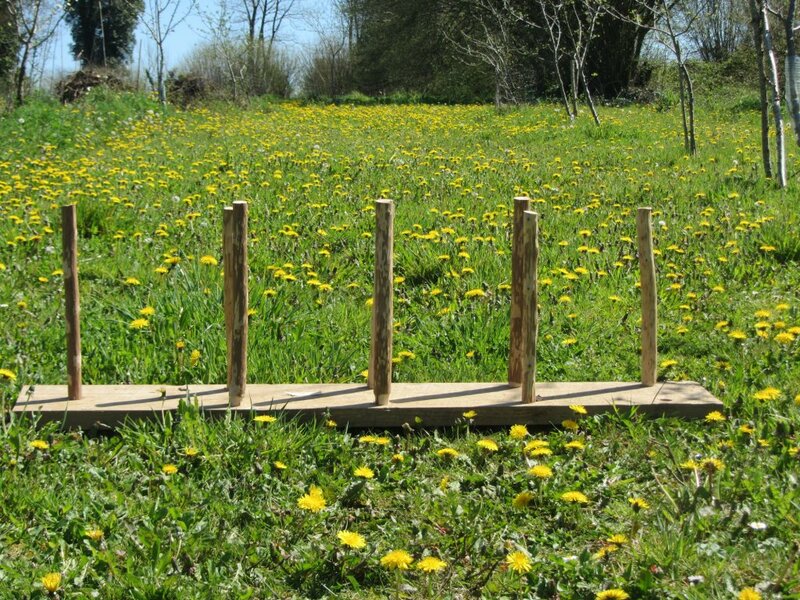 I am sure that those stakes are very firmly beaten into the ground so that they won’t lean as warping progresses. They look like they may be permanently positioned there. 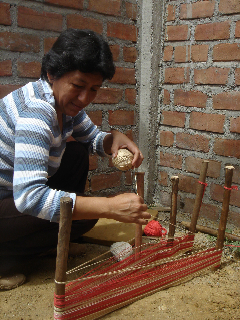 This weaver sets up two crosses as she warps as the Guatemalan weavers do. 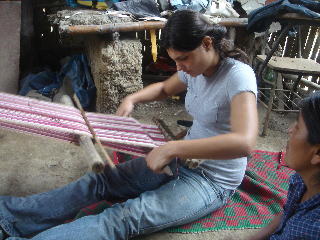 Here is Sasha’s friend settling down to work on her cotton warp. Sasha brought her unfinished weaving to show me and get some tips. She had set it aside and had forgotten how to operate it and her string heddles had gotten really messy. 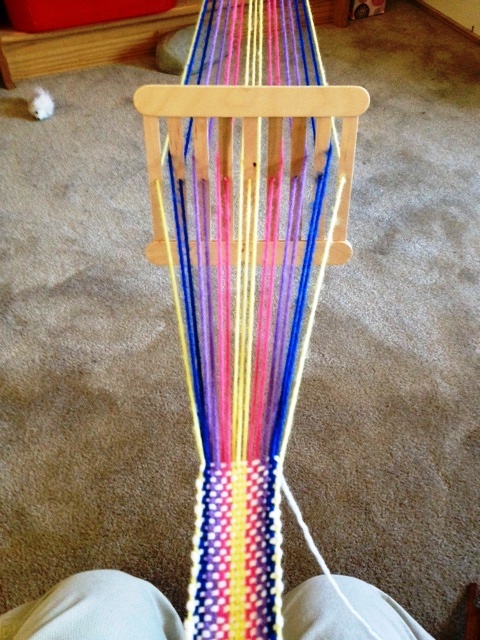 Amy sent me a picture of her home-made rigid heddle which she is using to weave a band. 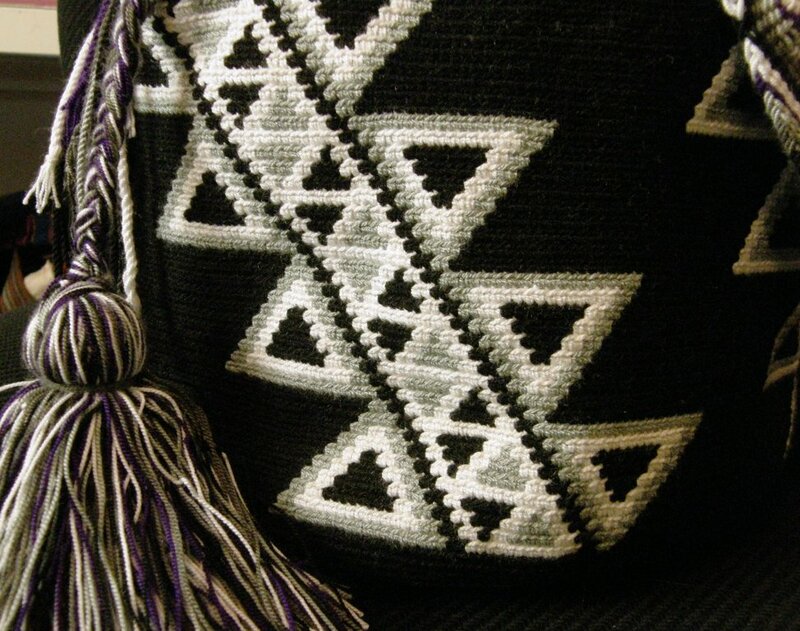 She wants to teach her children to weave with this as well as give Guatemalan children, who are residents on the US and who participate in a Latin American Cultural group, a simple hands-on weaving experience. And adventures with the famous coil rod continue in the Raverly group. Julia is using one on her single plane warp and loving it. (I have only seen it used so far on circular warps). I had been waiting to question Wendy about Bhutanese circular warps and how the coil rod is applied. 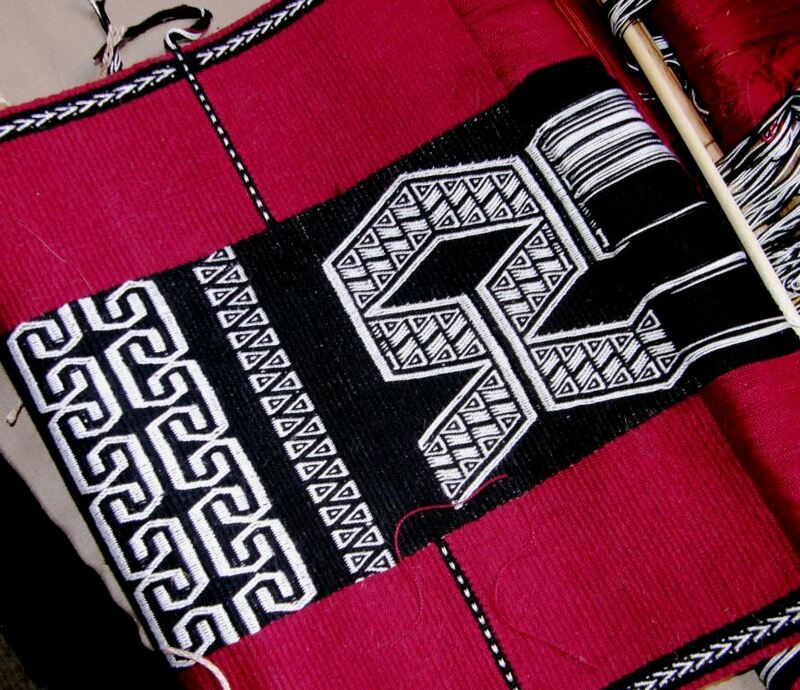 After having watched a video of Leki Wangmo warping and weaving, I had some questions and now have them answered. Yes, the story of the “curious coil rod” continues to unfold! I will tell you more next time. 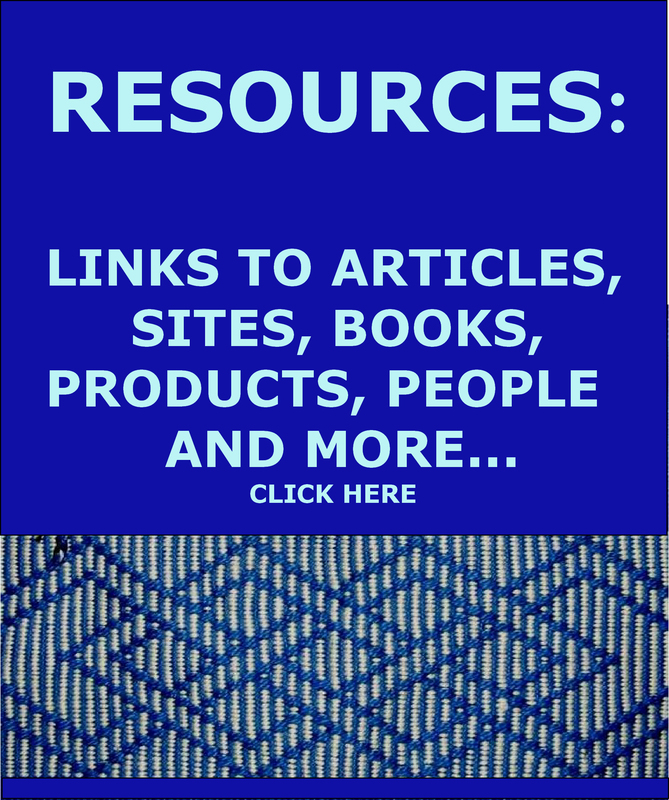 I am jumping between winding warps, cutting and hand sewing bands, playing with my inkle loom, photographing the inkle loom and drawing charts, writing an article, braiding , braiding and braiding warp ends and backstrap weaving. Oh, and yes, a little bit of dusting and armchair travel. 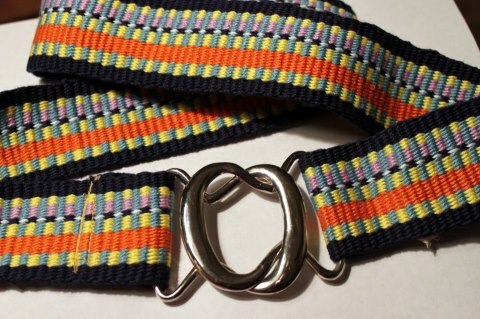 Let me leave you with Marge’s beautiful belt…woven on an inkle loom ….but it serves as great inspiration for a backstrap project and the buckle she has used solves all those problems of cutting a slit in the the band and making holes that a regular belt buckle requires. Beautiful work, as always. I especially like the colors of Janet’s handspun and that last picture of the belt is awesome. That belt buckle looks like a vintage one from the 70s/80s. Very cool. When you get a chance, Laverne, check out the little reed I made for my backstrap loom. I looked at the reed, Kristin…that is the sweetest thing ever…great work!! I can see that you really enjoy making things and have an eye for detail. It is hard to judge scale from the pictures but I know that you can get wood sheets that are probably much finer than the piece you used. That was what I was planning to use before I was lucky enough to get a genuine bamboo reed from China. I will see if I can find the source for the wood sheets. As always Laverne, thanks for the inspiration! Thanks Connie. I know you will put the inspiration to good use! I live in Taipei, Taiwan, too. I would love to meet you and weave together sometime. I have Laverne’s first book. Great! This is exactly what I had hoped would happen for Jenny! Karen, as blog owner I can see both yours and Jenny’s email addresses. Would you mind if I sent your email address to her in case she doesn’t get back to read your comment here? She is also on Facebook. Thank you. Help is on the way. Karen lives in Taiwan and wants to contact you. 🙂 I have seen you on Facebook. 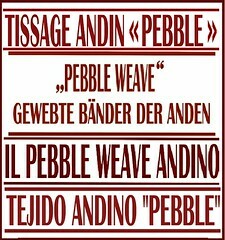 Thanks for your comments on my Andean Pebble Weave page. Many thanks for responding to my request. I would love to be in touch with Jenny. thanks again ❤ you look so happy with a fellow ausie, did she tell or show you something new in the Bhutanese textile world? Thanks Yonat. Yes, I got a few good tidbits of info from Wendy about Bhutanese weaving tecahniques. As for the textiles themselves, they are all new and wonderful to me. Too bad it is so expensive to visit there. You have to commit to spending $200 a day…no can do. I won’t be taking off for Colombia any time soon. There is still so much locally to learn! Una belleza!. Gracias por compartir la galería en Flickr!. Sabes que yo siendo venezolana, cuando fui a Bogotá hace unos años quedé impresionada por la seguridad del lugar. Claro no es comparable con meterse en plena Guajira (La coordillera de Perija siempre ha sido peligrosísima, pero el área guajira es la Península, puro desierto, arena, sal, monte y Cujíes -el árbol torcido por el viento). Lamentablemente las narcoguerrillas han hecho estragos. No te se decir del lado Colombiano, pero del lado Venezolano, puedes ir a Maracaibo y moverte hacia el norte. Te recomiendo que antes de ir busques a algún local (maracucho o maracaibero) que te guie bien, sobre todo para evitar “sustos”. Hay mucha violencia y criminalidad – razón por la cual no he regresado aún a mi país, pero creo que si te das un paseo por los mercados en Maracaibo, Mercado Guajiro en la Av. El Milagro (de artesanías únicamente), Mercado de las Pulgas -es más variado, un mercado en general, quizás puedas conseguir tejidos, y en el casco central se colocan buhoneros -vendedores ambulantes- donde puedes encontrar también algunas piezas tejidas. En Mara, Paraguaipoa (el mercado en la galería del Señor Araujo), y quizás puedas llegar a Maicao (cruzando la frontera, ya en Colombia), puedas ver algunas bellezas. No dejes de visitar la Laguna de Sinamaica. Yo estoy tratando de contactar a un tejedor en el mercado Guajiro de Maracaibo (mi favorito, y el que siempre visitaba cuando viví allá), pero ha sido complicado desde Alemania. Eso sí, no te pierdas los tapices! http://bit.ly/10w9oIe En google puedes encontrar muchos ejemplos. Luis fué un tejedor guajiro (Wayuu) que hizo famoso este tipo de tapices – los cuales hoy valen una fortuna! El telón de fondo del Teatro de Bellas Artes de Maracaibo es su obra maestra (varias veces pude literalmente acariciarlo, mientras ensayaba las obras de teatro de mi colegio). Una hermosura. Muchísima suerte en tus viajes si decides visitar la región! Gorgeous! Thanks for sharing the Flickr gallery!. You know, me being venezuelan, when I visited Bogota years ago, I was impressed by the security in the city. Of course is not comparable with going straight to the Goajira region (the Perija mountain range has always been a very dangerous place, but the proper Guajira region is the peninsula, just desert sand, salt, dry bushes and “Cují”, the tree twisted by the wind). Sadly the narcoguerrillas have made very difficult to be in those places. I cannot speak for the Colombian side, but in the Venezuelan side, you could go to Maracaibo and move to the north. I recommend to you to contact someone local to guide you through and to avoid “scary moments”. There is indeed a lot of violence and criminality right now, reason why I have not come back to my country- but I think you can visit anyway the markets in Maracaibo (Mercado Guajiro in El Milagro Av. (artisans market only), Mercado de las Pulgas -a real market, maybe you can find textiles there too, and in the historical downtown there are ambulant sellers where you could find textiles as well.) In the northern towns of Mara, Paraguaipoa (the market in the Flickr gallery) and maybe you could go to Maicao, crossing the border in the Colombian side. In these towns you will find several beauties. Don’t forget to visit the Sinamaica Lagoon. 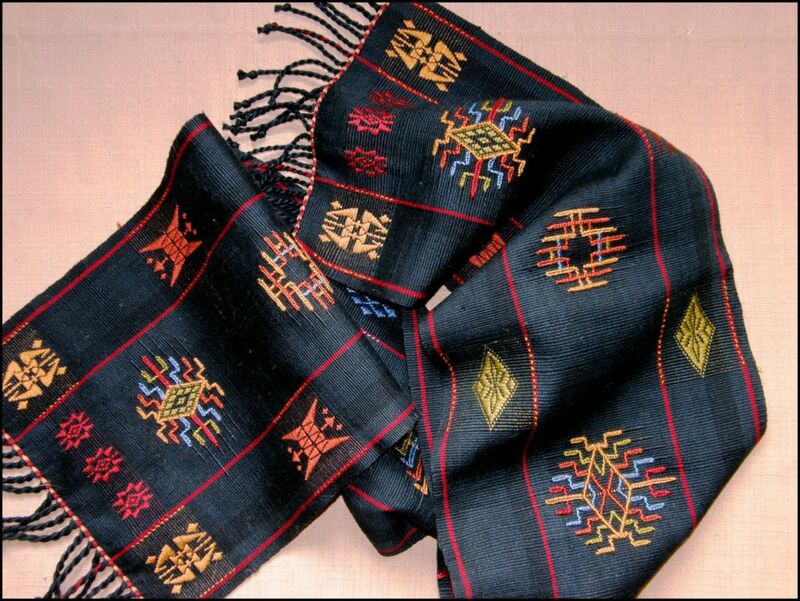 I’m trying to contact a weaver from the Artisans Guajiro Market in Maracaibo, but it has been very difficult from Germany -where I live. Ah and don’t miss the tapestries! http://bit.ly/10w9oIe. In google you can find several examples. 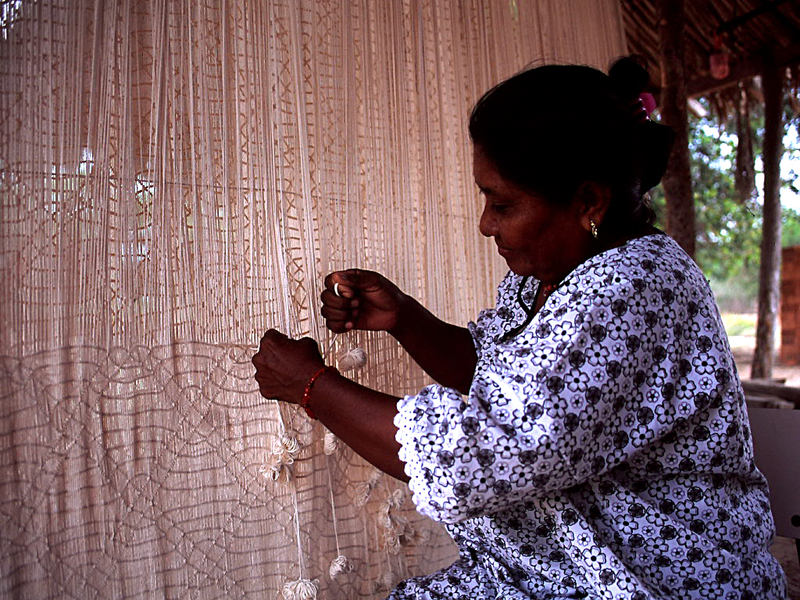 Luis was a very very talented weaver who made famous these kind of tapestries. His best work is hanging today as the main curtain in the Teatro de Bellas Artes (main theater) in Maracaibo. I had the opportunity to literally caress it and admire it from close while practicing our school plays. A master piece!. Good luck in your travels if you decide to visit de region! Thank you Van for all that information. I would definitely want to avoid any “scary moments” and I will take your advice very seriously should I ever got to those places. The tapestries you mention are wonderful. Thank you so much for the link. Hi Laverne, Over the weekend I went to a living history show and saw an interesting antique band weaving stand. I’ll send pics. As usual I enjoyed your post. Thank you! Thanks Terri. Would love to see those pictures. I have had those pictures from Piura for a while but sometimes the information just doesn’t register until the right time comes along. I will let you know about any possible trips to the lowlands. I need to do some lowland exploration a little closer to home first, though. 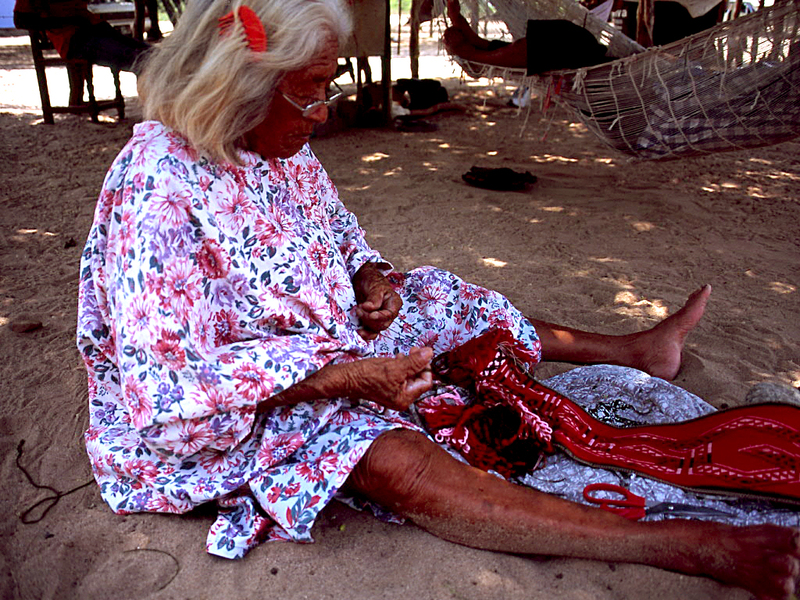 This was a wonderful glimpse into the craft of the Wayuu people. Thank you and Mr. Araujo for sharing it. All of the pictures are fantastic, but my favorite has to be of Ms. Maria Úrsula Ipuana’s hands. Oh, the stories they could tell. Oh my goodness! 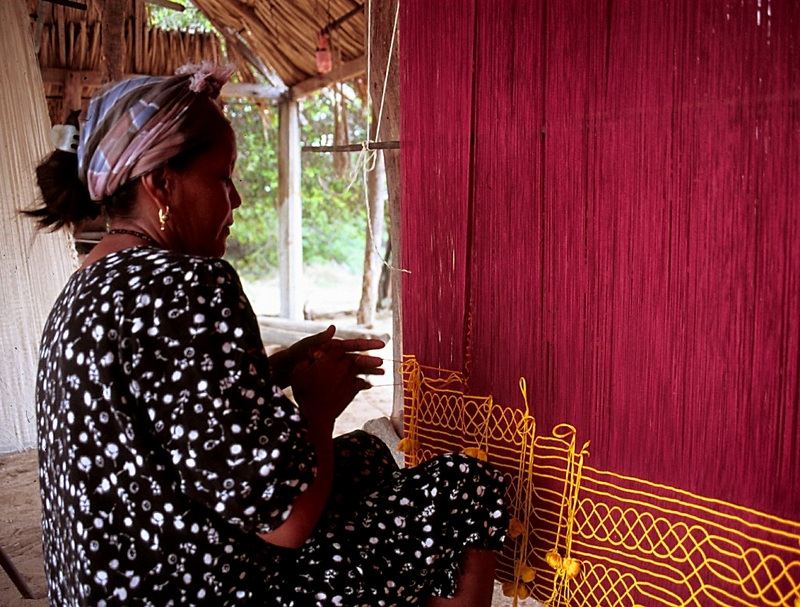 The Wayuu women twining across large groups of warp ends to make a hammock is amazing! I don’t quite understand what exactly they are doing. 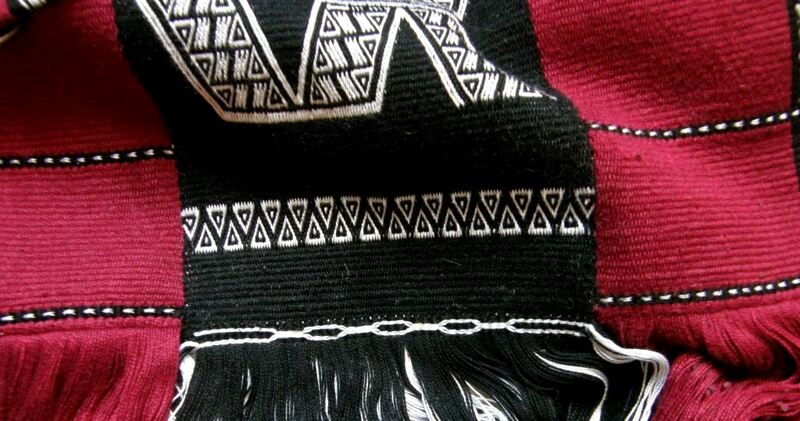 It appears to be less dense than the warp twining done by the Vietnamese women. 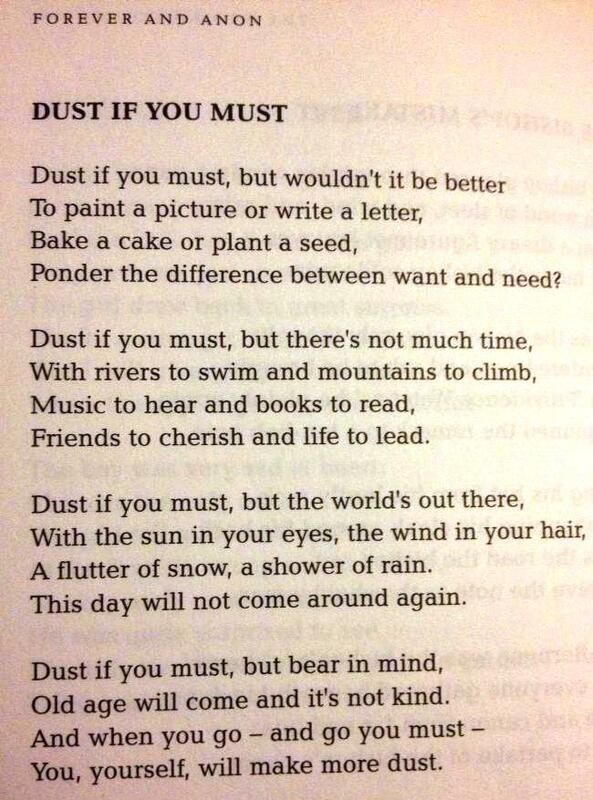 And the “dust” poem. Excellent! That will find a good place in my house! Your weaving with the beautiful handspun is so lovely! Wool has such a soft look. Oh my, the red/green/yellow crocheted susu basket just took my breath away. I have tried tapestry crochet using Carol Ventura’s book, More Tapestry Crochet, but this is just exquisite. Thank you Laverne for including it in your post. I hope you get to Columbia and can show us all the wonderful techniques they are using. As for dust, most of the time I don’t disturb it. Since we live on a dirt road and we get no rain for the entire summer, I live with it comfortably. My rationale is that it protects things and is a great way to let the ancestors continue to be with me.